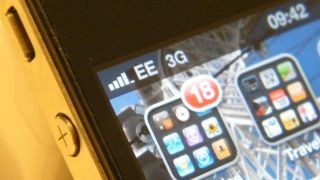 EE has finally lifted the lid on its impending 4G prices, revealing some pretty eye-watering costs. The new service will be launched on 30 October, and will feature other treats such as free films weekly and fixed line fibre optic broadband. The pricing for the new 4G service is the subject most people want to know about, and while it's not going to cause you to need a new mortgage to get involved, it's not exactly cheap either. For just 500MB of data you'll need to fork out £36 per month, with 1GB costing £41 for the same term. 3GB will come in at £46, 5GB £51 and the top end tariff offering 8GB for 56 pound coins each payday. As if the monthly costs weren't already enough, you may need to brace yourself when you cast your eye over the handset costs. The cheapest, by a country mile, is the Huawei Ascend P1 LTE, which will set you back just £19.99 on the £36 per month contract, while you'll be able to get it for free on anything higher. That's about it for the good news though, as the next cheapest handsets at the £36 per month level are the HTC One XL and Samsung Galaxy S3 LTE, both of which require you to shell out £149.99, with the most expensive being the iPhone 5 64GB, which costs £379.99. Other than the Ascend P1, none of the other handsets can be picked up for free, even on the highest, £56 per month contract. The full details can be found in the table below. If you don't like the idea of being tied down for a whole two years, you can opt for a 12 month contract, which will see you pay slightly more each month, but the handset prices stay the same as shown in the table above. Each tariff level on a 12 month contract will be £10 dearer than its 24 month equivalent, so the cheapest option with 500MB of data will set you back £46 per month, while the most expensive is £66 per month, giving you 8GB of data. It's worth noting that all these tariffs come with unlimited phone calls and texts, but when you consider you get unlimited data with T-Mobile's Full Monty plan for the same cost as 500MB on 4G, you have to wonder where the extra cash comes in. Of course, with greater speed comes larger downloads, so unlimited data on 4G isn't something that would make a lot of sense at this stage, and of course this new billion pound equipment has to be paid for somehow. But there will be a lot of consumers wondering why their data costs so much more for a faster connection – at least EE is going to give a free film to download or stream each week, without affecting their data allowance, and other films will start at 79p, rising to £3.99 for the most expensive. Users will have the choice of 700 films at launch, with 200 new releases, however it's worth noting that all films will only be available in standard definition, slightly disappointing as the 4G handsets sport full HD displays. On top of the 24 month contract, EE will also be offering 12 month SIM-only plans from November 9, starting at £21 per month all SIM-only deals include unlimited calls and texts. Prises for the SIM-only plans will rise depending on how much data you want coupled with your tariff, more details on this will become available in due course. If you're concerned about blazing through your new found 4G data allowance in a matter of days, EE has your back, as the network will send you a text once you've ploughed through 80% of your monthly allowance. You'll receive another alert once you've used all your data, and it will offer you various data add-ons to see you til the end of the month - or you can opt out and stay data free until your balance resets. Fibre optic broadband will also be on offer, with speeds up to 10 times faster than currently available in homes and offices. The 4G service will also support tethering and VoIP telephony, although we can see most consumers veering away from these services if they don't want to impact their data allowance each month. If you fancy taking EE's home broadband package and a 4G phone plan together you will be offered a discount of up to £120 on your phone plan. All those that have taken out an Orange or T-Mobile contract in the last six months can jump onto the new network, with the option to upgrade to a 4G phone.